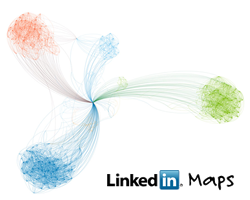 InMaps is LinkedIn’s connection-mapping tool and unlike Facebook’s 2007 Friend Wheel which was multi-coloured and extremely pretty to look at didn’t tell us anything that we didnt already know. On the other hand I have found InMaps really useful – not only is it fabulous to look at but it tells you a lot about your networks. The clusters, for example give you an immediate and in-depth visual representation of your key business networks and where they overlap, which can be difficult to see in a simple list of contacts. This helps you to make sense of your networks as you can also label each of the clusters. Understanding the connections between people in your network can be important especially when you need to get things done. Knowing who connects to who when pulling together a team or project means you can work with people who already know each other. Keep an eye out for clusters around particular sectors or areas of knowledge as if these fit with your business these contacts have the potential to be hot leads. InMaps will also show you who is best connected in your network, as these ‘influencers’ appear as larger dots within the map, so you know who you should be networking with. I am interested to find out any other ways that people are using InMaps? Can Twitter help you grow a business?